When Bloom Teas contacted me and kindly offered to send me some of their matcha powder to try, to be honest I was a little hesitant to accept. When I first became ill I tried matcha for the first time in the hope that it would give me some energy and I really did’t like the taste, even when I tried to disguise it in porridge. The lady I was liaising with at Bloom Teas recommended I try their ‘Mindpower Matcha’ which combines matcha with ginger and ginseng and has a more subtle matcha taste. I couldn’t agree with her more. 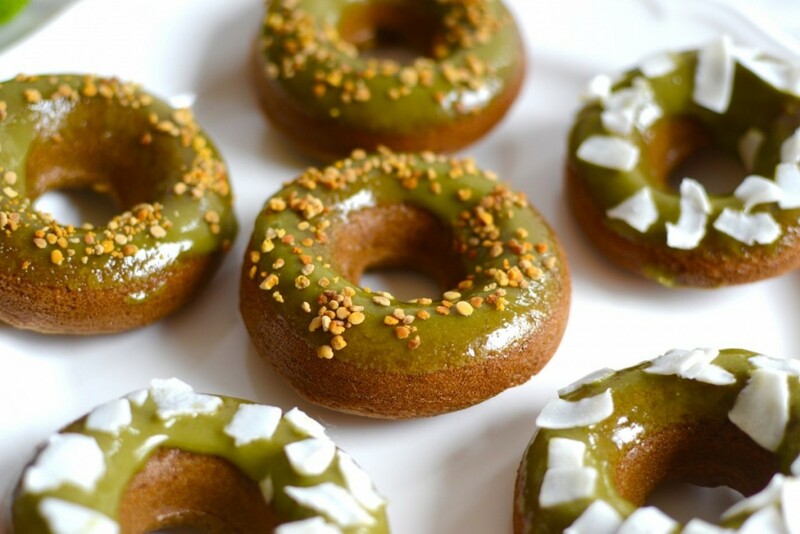 I added a fair amount of matcha to my donuts and the glaze and I can only taste matcha very subtly and it’s really nice!! I am definitely open to experimenting more with matcha now in my cooking/baking, especially as it has so many health benefits. Matcha is packed with antioxidants, detoxes, and is very calming. It also provides slow energy release for a sustained boost throughout the day unlike coffee that gives you a spike and dip of energy. 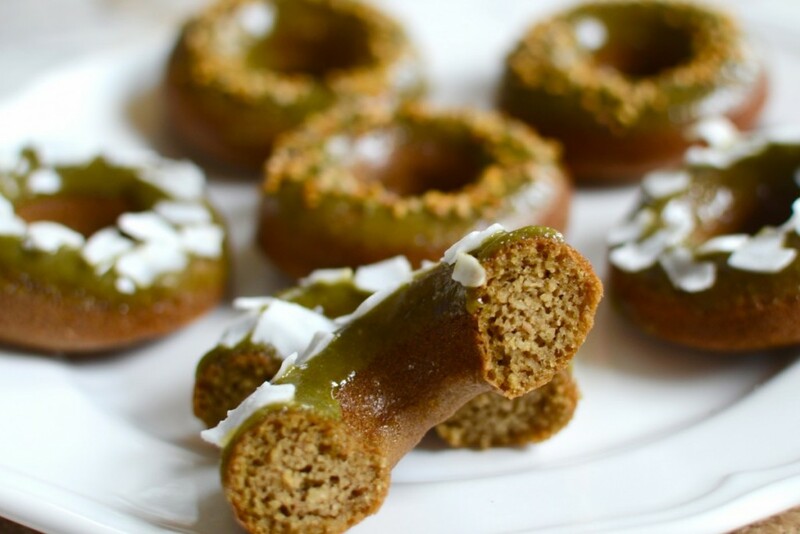 Back to the donuts – these are very simple to make and can be ready to eat within 20 minutes. Although baked donuts do not taste quite the same as the fried sugary ones everyone knows, they are beautifully light and fluffy and perfect for a mid morning/afternoon snack. They’re totally healthy which is hard to believe especially with that sticky sweet glaze on the top! 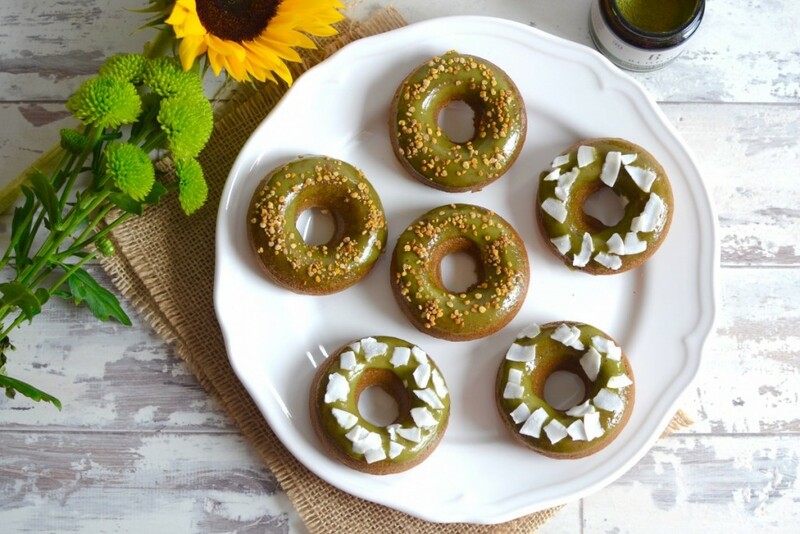 If you are a huge fan of matcha, feel free to increase the amount of it in the donuts with 1/2 tsp more. Add the eggs to a bowl and beat until light and fluffy. Add the rest of the wet ingredients (coconut milk, vanilla, maple syrup, coconut oil) and mix until combined. In another bowl, add the dry ingredients (matcha, almond flour, baking soda and salt) and stir until evenly mixed. Pour the wet ingredients into a food processor and then gradually add in the dry ingredients mixing in-between. 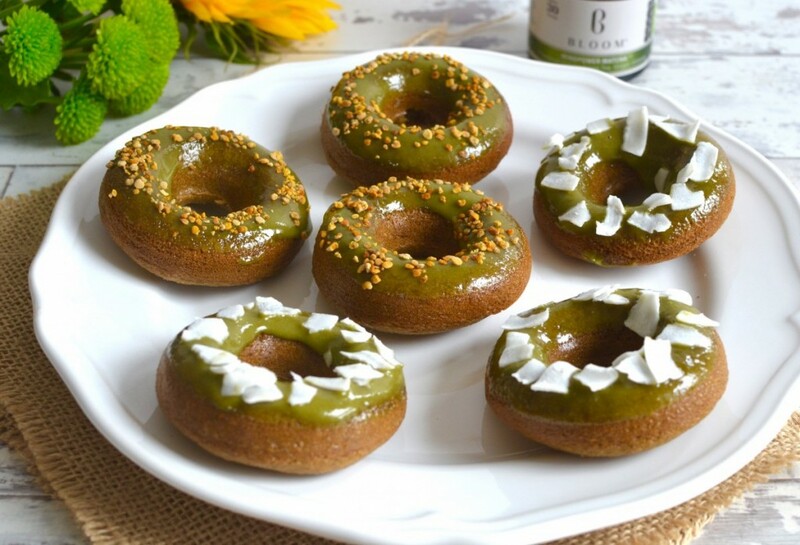 Greece a donut pan with vegan margarine. Fill each donut cavity until they are 3/4 full. Bake in the oven for 18 minutes or until golden and a toothpick comes out clean. Allow to cool for a couple of minutes before removing the donuts from the pan. Let them cool completely on a drying rack. Meanwhile make the matcha glaze. These look great – as does your new website! Definitely need to find some time to try out some of your recipes… Being veggie & dairy free I’m always open to trying out new things, never even heard of matcha before though! Thank you Amber!! Lots of the recipes are quick and simple to make, I really hope you enjoy! If you like green tea then you’ll love matcha!